The building of the Unitarian Universalist Fellowship of Ames is a registered art gallery, open to visitors during regular office hours (Monday through Thursday 10:00 am to 4:00 pm, Friday by appointment) or at other times by appointment. To make an appointment, call the Fellowship office at 292-5960. For more information about the gallery, or to purchase artwork from one of the exhibits, contact the Art Exhibition Committee. The goal of the Art Exhibition Committee of the UUFA is to exhibit spiritually enriching art work that supports the creative process in us all. The art exhibition area of the Fellowship building, known as the Gallery in the Round, has a dual role as a continuing aesthetic and artistic enrichment to the practice of ethical and liberal religious ideals within the UUFA and as a community-based professional art gallery, associated with the Ames Community Arts Council. The Art Exhibition Committee supports and encourages freedom of expression in all its activities. Issues of diversity, individuality, complexity, inventiveness, artistic quality, and the presentation of ideas and issues are considered in the selection of the exhibition program. The content of each exhibit is at the discretion of the Art Committee, using the common principles of the Unitarian Universalist Association and the stated goals and policies of the UUFA as guideposts. The Committee welcomes the open discussion of issues and ideas raised by the exhibited art works (and the artistic processes employed in their creation). Procedures for the educational resolution of differences in interpretation, opinion and taste are in place as the committee focuses upon the open sharing of views and support for spiritual fellowship within our religious community. For the past several years, Harris & Pappenheimer have been collaborating in their own studio work experimenting with various surface design processes on both textiles and paper. These processes include indigo vat dying, shibori, and deconstructive screenprinting to name a few. The collaboration involves the exchange of partially made pieces back and forth allowing each other to continue developing the work until both have agreed it is finished. Many of the processes they use, they are doing for the first time, an exercise in experimentation/ chance taking and learning new things. The exhibit displays the results of this continuing collaboration and much of their independent work. Margaret Whiting explores contemporary issues related to land use, encouraging thoughtful consideration of the laws that regulate American society's impact on the land. She uses discarded law books, science books, encyclopedias, dictionaries, and maps as her media. 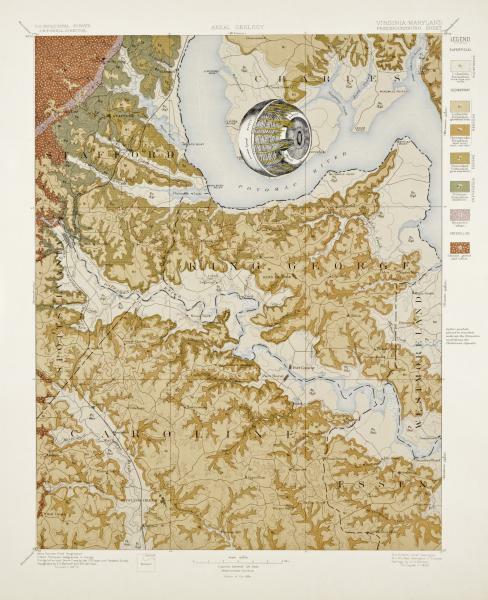 "I placed human anatomy textbook illustrations onto early 1900s geologic survey maps to show striking visual similarity between our bodies and the natural landscape. Humans are connected with the land on many levels. Today more than ever we must protect the natural environment to safeguard our own health. I am fascinated by the repetition of patterns found in nature. 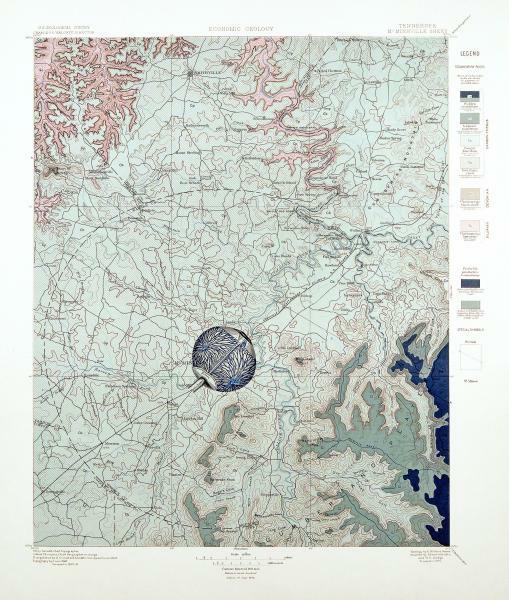 Geologists and medical illustrators have used identical color combinations, patterns, textures, and even the same words. 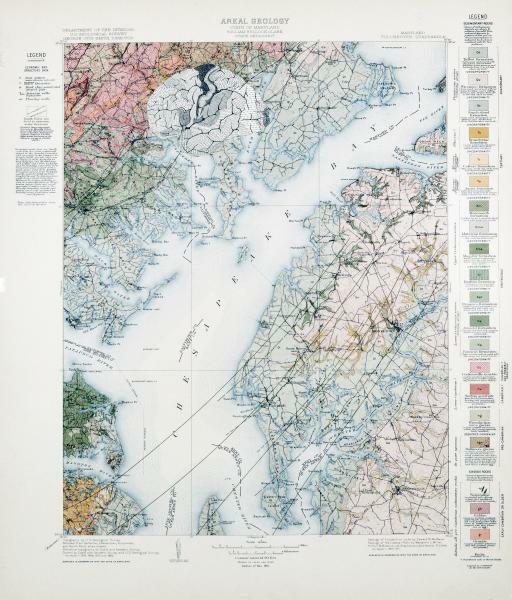 Humans superimposed their own patterns on the land. 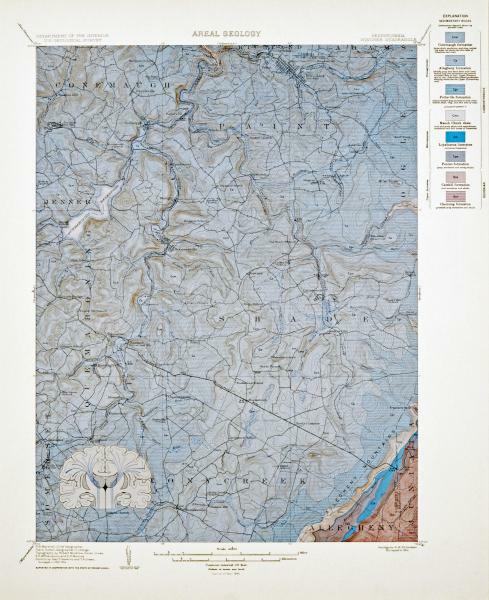 Oil wells, copper mines and veins of coal can be seen in these old maps. Man has certainly altered the land since these maps were printed. The human impact on the land affects human health since air pollution and disposed waste will ultimately lead back to us." Whiting grew up on the Mesabi Iron Range of Northern Minnesota and now lives in Waterloo, Iowa. She received a Bachelor of Science Degree in Medical Technology from the University of Minnesota and a Bachelor of Arts Degree in Studio Art from the University of Northern Iowa. She worked as a medical technologist in hospital laboratories and taught workshops in weaving, papermaking, and bookmaking. Whiting is active in several environmental organizations and currently serves on the Executive Committee of the Iowa Chapter of Sierra Club. Her works have been featured in exhibitions across the country and internationally. For descriptions and photographs of previous exhibits, please click here. Exhibits are displayed for approximately seven to nine weeks. The gallery receives a 20 percent commission on sales. Receptions are encouraged. Artists furnish the food; the gallery furnishes coffee, cold drinks, and all paper products. Each exhibit is insured up to $20,000. Individual pieces are insured up to $5,000. The Art Exhibition Committee will hang the exhibit, with the artist's input when possible. For more information, contact the Art Exhibition Committee or the UUFA Office (292-5960, uufa@uufames.org).